Do you have a rival? Kathryn does—her name is Brooke. They used to be best friends, but after Brooke punched Kathryn over a big misunderstanding they have been rivals ever since. Always fighting their vocal cords to be the best in choir. Always to hold their heads high and try not to notice the other. But when they are both chosen for the Blackmore, a singing competition, things start to heat up once more. Now they are fighting against each other for a prize much greater than outshining each other in high school. The Blackmore is a big deal. With the constant stress of the competition, will this rivalry make them stronger or just tear them apart? I loved, loved, loved this book! 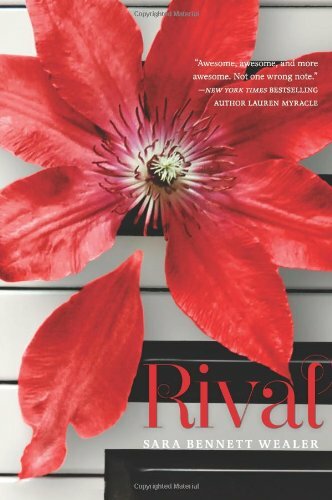 Rival is a masterpiece filled with notes higher than I can even start to imagine singing. Yes, this book circles around two girls who sing in choir—they take singing very seriously. Kathryn is the quiet, yet beautiful girl who doesn’t have many friends, but is still able to get most of the solos in choir. She was the character I could relate to the most. She was kind and overall a wonderful friend, despite the mess-up that started it all. Her best friend, Matt was the ultimate geek. He played video games and spent most of the novel watching The Lord of the Rings movies (I love him already). If you don’t have a friend like Matt, go out and get yourself one right now because his geek-iness brightened my day. Now Brooke seemed to be the complete opposite of Kathryn, except for the small similarity of them both liking to sing. She was the cliché, the popular one, the one whose rich daddy didn’t have time for anymore. Her character was exact and perfectly drawn that even though she was a bit of a cliché, I still loved Brooke. The structure of the book was fantastic. Each chapter would switch perspectives of either Brooke or Kathryn. This helped the story grow brighter and clearer than if there had only been one perspective. Wealer would begin to almost sing through some of the chapters. Her voice was lovely and kept my interest throughout the entire book. There was a lesson learned here, by the end. Not all books execute their lessons well but Wealer brought this unique story together by creating well-developed characters that you will not forget. If you are hesitant of reading this novel, don’t be. It’s a mix of American Idol meets Mean Girls. It’s a fantastic twist on friends that turns into rivals, walking away from one another even stronger than before. "I saw an old commercial once where famous singers used their voices to shatter glass." Rated PG for mild violence.